We are a leading Manufacturer of floor decking forming machine from Rajkot, India. Floor Decking Forming Machine is manufactured by us. Made by using sheet or coil stock, these machines fulfill profile complicity requirements. This machine is also known as Steel deck forming machine. 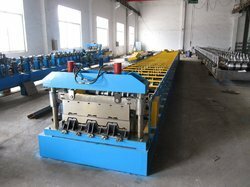 This machine is also known as Steel Deck Forming Machine.